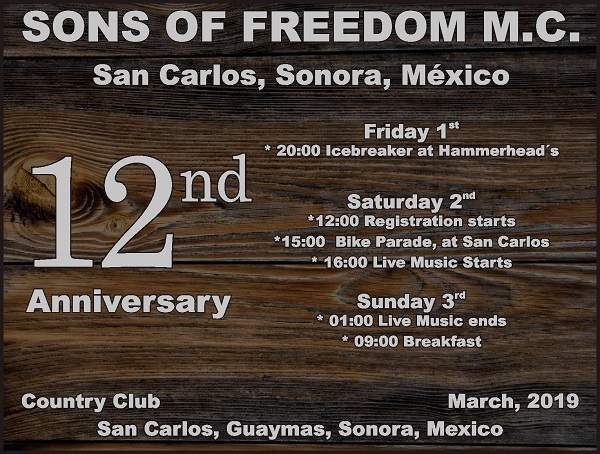 From March 1 – 3, the Sons of Freedom are holding their 12th anniversary at the San Carlos Country Club. There will be live music all afternoon and evening on Saturday, March 2. This event is open to the public and is free. 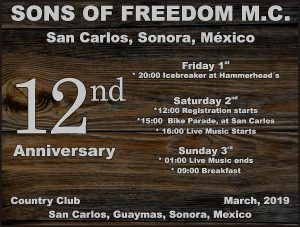 This is a party for the community to thank everyone for helping the Sons of Freedom help the less fortunate in our area. Come by to see the bikes, enjoy beverages and food and listed to live music.